Offering cashless payment options is all about guest convenience that translates to increases in guest spending. Although cashless payment has been available, it has typically been at attended point-of-sale locations such as snack bars and tuck shops. Building on over 10 years of experience, cStar Technologies has become the industry leader in cashless payment solutions for unattended (self-serve) point-of-sale machines, enabling cashless payment in vending, arcades, parking, lockers, business centers, laundry facilities, and photo booths, to name a few applications. 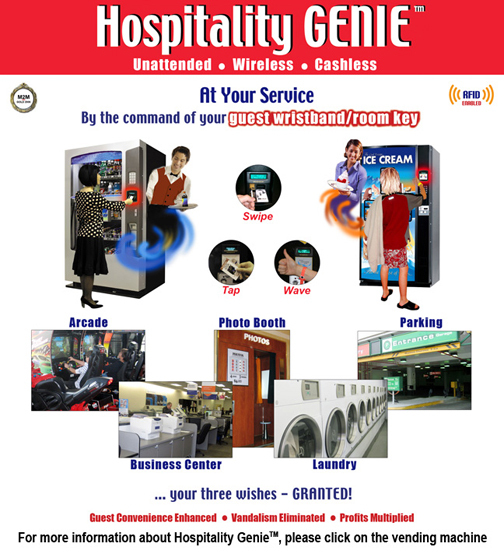 cStar deployed the industry-first wireless cashless hotel room key card vending solution in March of 2004 - Hospitality Genie™ - which was awarded the prestigious M2M Gold Value Chain Award in 2006. Hotels and resorts present numerous opportunities for cashless applications for enhancing guest experience and also for deterring the unwanted visitors that cash in unattended point-of-sale locations can attract. Overcoming the challenging complications of integrating various hotel property management systems (PMS) and room key card systems that can create obstacles in cashless application deployments, cStar has developed a turnkey system with hotel/resort specific backend applications that is readily deployable, eliminating any lengthy integration or development work. Hoteliers are delighted in cStar's solution for ease of use for their guests and the complete elimination of cash theft and vandalism from their unattended POS venues. cStar's Hospitality Genie™ solution can create a wLAN closed payment system that integrates to a proprietary payment settlement application, such as the hotel PMS or a stored value system, eliminating expensive wireless cellular airtime and credit card processing charges. cStar's Hospitality Genie™ solution has its own pre-paid card management module and credit card payment module to provide the ease of deploying a complete cashless payment system for all unattended POS applications. cStar's Hospitality Genie™ can deliver the above benefits of cashless unattended POS applications to hotels, casinos, theme parks, water parks, resorts and other family entertainment centers. Take advantage of the available cashless applications or talk to us to explore other cashless application possibilities for your specific needs. Customers no longer need correct change or cash in hand to purchase beverages, snacks or ice cream from cStar supported vending machines. CStar readers support all major makes of vending machines - Crane, Dixie Narco, Royal, Vendo, Fastcorp, AP, Wittern, etc and the bottler-branded machines. For a greater operational cost reduction, Vending Manager application module polls vending machine DEX data for efficient vending service management and remote vending machine health monitoring. cStar's readers for arcade applications support pulse and MDB enabled arcade token dispensers of the major manufacturers - American Changer and Standard-Change Makers - and various arcade gaming machines that accept bill validators. Offer cashless convenience to your arcade customers and see your arcade revenues jump. Compliment your photo booths with cashless payment options and increase sales. Whether you have photo booths as part of a family entertainment center or in an independent setup, enabling cashless acceptance in photo booths results in greater customer convenience and increased sales. See sales go high with significant increases in multiple purchases from cashless payment options. Online (real time) guest room key card parking is possible with cStar's intelligent real time guest status verification system. Regain control of your limited parking spaces and parking revenue and eliminate parking abuses inherent with widely used off-line room key card parking systems. No more separate parking cards for guests. Front desk check-in steps are stream lined by simply enabling parking for guests through the normal guest check-in and room key card cutting process. cStar's solution also includes a one-time / single day parking access solution for non-staying hotel guests with separate user interface application and parking card encoding capability. Conveniently manage and control short-term or long-term locker rentals to provide added convenience for guests and add another revenue stream for your property. Offer the convenience of room key card cashless payment to your traveling business guests at your 24/7 unattended business centers. Add room key card acceptance to your existing pay per use fax, printer, copier, and PC workstations. You can have complete transparent sales details of your business centers not relying on third party reports. Extend cashless payments to laundry machines for your guest convenience. No need to provide change or install change machines. Eliminate cash handling and internal cash shrinkage problems with transparent transaction reporting whether the machines self operated or third party operated.